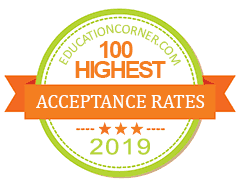 The following list includes the top 100 colleges in the United States with the highest acceptance rates for entering freshman for 2019. While some colleges and universities have a policy of only accepting a certain percentage of applicants, these schools pride themselves on welcoming as many students as possible each year. Learn more about our ranking methodology.